Slime Play Gunky Green turns water into a gooey, oozy slime. Sprinkle Slime Play powder into a bowl full of water to transform into goo. 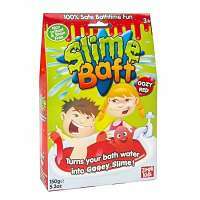 Now you can enjoy your Slime Play experience. Turn on the taps and empty the bowl into the sink to dilute the slime. 100% degradable. Slime Play products have clocked up over 3.5 BILLION views on YouTube since October 2015 from independent reviewers worldwide and figures are showing no sign of slowing down. Averaging over 4.9 million new views EVERY DAY, that’s 59 new views EVERY second! A miniature edition of the world's most popular 3-D puzzle is now presented by World's Smallest! This popular cube's dimensions have been reduced in size to 3/4"x 3/4" x 3/4"- the actual size of one die! Making it the world's smallest rubik's cube. Challenge yourself to manipulate and maneuver the cube to match each side of the cube with one solid color!